First day was quite an experience. CJ was not feeling great the night before we left. We left at 7 am Thursday and flew to Miami. By the time we got there, CJ was really showing signs he was sick. We made the decision to get him a flight back home. 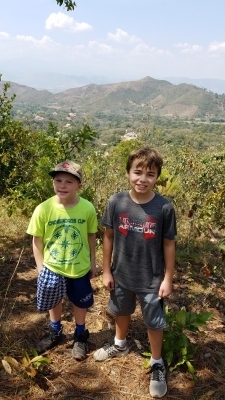 It was difficult, but I didn’t want CJ in Honduras if he was going to be severely ill. I was very bummed, it being Owen’s first trip. I was really excited to have both boys here together sharing the experience. After arriving in Tequcigalpa, then being bussed to Comayagua, we stopped at the Hogar (girls orphanage) to reconnect with some of the girls. Then we checked in at the Hotel Antigua and as our first night custom called for, we enjoyed our traditional Chinese dinner. This year there were just over 30 people on the trip. Some new and many that come every year. Although I only see some of the men once a year, we have a common bond in Christ and connect easily. For me, the trip to Honduras is one of the highlights of my year. I completely unplug from everything that is normal and just be present. I am missing CJ, but looking forward to the next few days with Owen experiencing all God has planned for us. Our first evening devotional was led by Al Herrema who coordinates this trip and gives himself fully to the charity, “All God’s Children” who gave the men three biblical principles to consider for raising children. Children get their self-image from what they believe dad thinks about them. Proverbs 17:6 Grandchildren are the crown of the aged, and the glory of children is their fathers. Proverbs 18:21 Death and life are in the power of the tongue and those who love it will eat its fruits. I am already in deep reflection of how I can be a better father. There will be nothing more important that I do in my life than raising CJ and Owen. The second day didn’t go as well as the first. Before CJ took his flight back to Chicago, he graciously gave me whatever crud he had. I’ve been in bed in the hotel room the last 24 hours. I was able to get most of the first day in. We visited the Hogar (girl’s orphanage) as well as he Farm (boy’s orphanage). I am used to Dago (our driver) beeping the horn and the kids yelling and screaming with excitement. They are a happy bunch of kids, which is amazing considering the tragic lives most of them endured before they came to the orphanage. It’s a lesson for me, that love is the great healer. These kids find love and care at the orphanage and most get better. Owen has been a great fit. He has played non-stop both with the kids on the trip and from the orphanage. I think he would tell you his favorite part was sneaking up on his Dad with some of the orphans and bombing me with water balloons. My favorite part of the day was getting even, which I did. After we got done with our visits, we went back to the hotel. I went to bed and the group went to Nellies. If you haven’t done it yet, click on this video to see Nelli’s story. 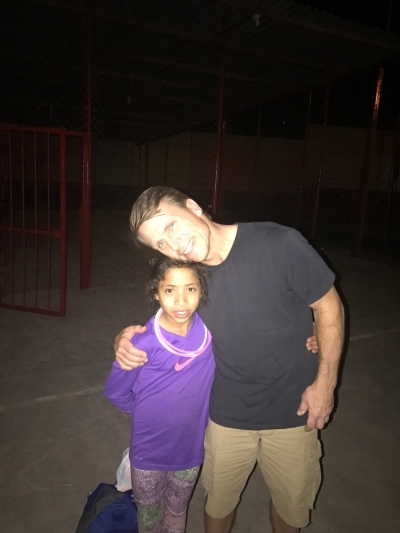 It is an amazing story of a young crippled woman in Honduras who has given her life in the sacrifice of others. One of the lessons I hope both my sons get from this trip is that they realize a life worth living is one where you think more about other people God has put in your life versus yourself. Also, that one person can really make a difference when their heart is in the right place. For me, the third day wasn’t much better than the second. I spent the day in our hotel room wishing I could get over whatever crud is in my system. The people at the hotel made our dinner, so I ate with the group, then joined in our evening devotional, which was led by Jim Hallene, one of the men who organized the trip every year. I really enjoy the devotionals. They become a time where people are sharing their own personal experiences. I like to hear different people’s perspective on what we are all experiencing. Owen on the other hand had a full day. The group started out with a visit to the Brickyard. I remember the first time I went to the brickyard and saw a father working with his two sons making bricks. The only real difference between that father and me was that I was born in America with an opportunity that these people will never have no matter how hard they work. The next stop the group made was to Buen Pastor, which is a home where teenaged girls that were raped are able to live in safety, peace, and tranquility with their babies. Every year I have been able to visit and witness firsthand how love and community can heal the deepest of wounds. These young girls display so much love toward their children that were ultimately no choice of their own. The last visit the group made was to the hills where we typically hand out all the clothes the group brings. The Hills are probably where the poorest of the poor live. They live in makeshift homes where just getting food to eat is the most important goal of the day. 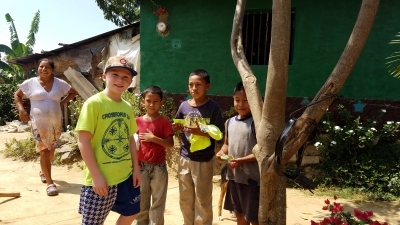 Owen spent the last part of his day playing with the kids at the Hogar, undoubtedly his favorite part of the day. Day four. The good news is I recovered enough to spend the last afternoon at the Hogar. We held a soccer tournament for all the different age groups of kids. Owen and I missed the morning church service which is a two hour catholic service done in Spanish. I didn’t trust myself in that setting, plus it’s 90°. Even though I don’t understand anything that is being said, I always enjoy going to church with the girls and sharing that time with them. In the evening, we had our goodbye party where we serve the kids pizza. It’s always a fun evening ending with a lot of sad good byes which are ultimately a good thing. Our last evening as tradition calls for, Ray Carter (my very good friend, mentor, and pastor) led one last devotional. Every year he singles out each child in the group and affirms something he identifies that God made special about them. He told Owen that he was wise beyond his years and that he had an understanding of things around him that most children his age wouldn’t have. I thank God again, to allow for this amazing life changing experience I have been able to share with my sons for the last five years.